Work and stress go hand in hand. In fact, more than 75% of adults have reported from medium to high levels of stress, anxiety and depression while at work. Globally, China has the highest stress levels at 86% while the United States was at 83%. From Australia to India, Russia to China, America to France, there is a dangerous rise of people burning out from excessive work hours, aggressive work environments, and leadership failure. These figures paint a grim picture of an average adult suffering mental and physical breakdowns simply because the work culture is too cutthroat and too demanding. Adding to this stressful situation is the rise of new media and new age order that encourages employees to quit their jobs and travel or create their own startup. This movement rallies against the 9-to-5 routine instead of helping people to manage it, and this is why employees end up feeling more stress, more depressed, and more underaccomplished. Let’s see the journey of an employee on a regular day to understand the deep levels of stress they experience each day. The day of an employee starts with waking up at wee hours, drowning themselves in coffee and other stimulants, quickly grabbing a bite on the go and then slogging at the office desk until late hours of the evening. During the entire day, they have to undergo several stress triggers - a rude boss, an envious colleague, boring, meaningless work and to that mix a social media newsfeed that messes with their thought process. Pictures of friends and family traveling, articles of how someone quit their day job and became a success, articles praising the nomad and the entrepreneur who took the leap of faith and left their dull jobs. But surprisingly, there are no articles talking about the heroic office worker who has to battle depression, anxiety, and a host of other mental stressors. There are very rarely articles that actually reach out to this employee and encourage him to make a change in his life and mindset in order to manage his work life better. If you are that employee reading this piece, this article is for you. You don’t have to quit your job and travel to beat stress. You don’t have to race against time to become an entrepreneur to beat stress. 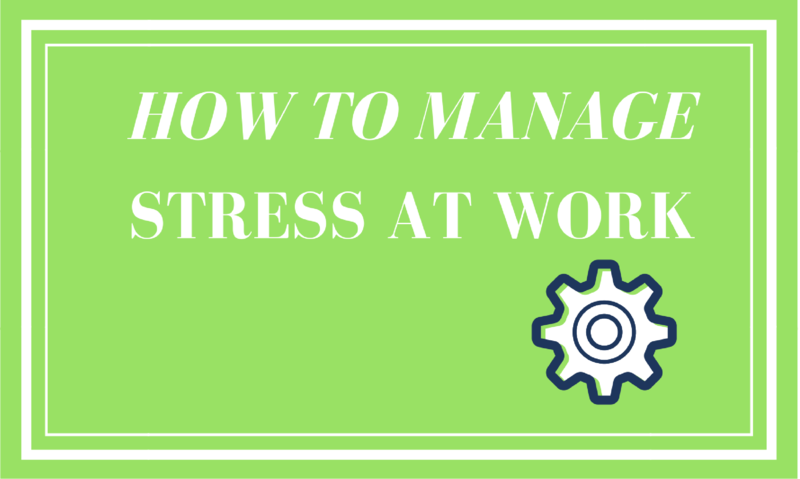 All you have to do is learn how to manage stress at work. Here’s a quick guide on how you can achieve that. The first step to managing stress at work is changing your mindset. So many of us believe that we should accept mediocrity or that it’s our fate to be whatever we are destined to be. To this effect, we let our bosses control us, we let our colleagues harass us and we allow ourselves to be wasted. Everything starts from the mind. This doesn’t mean you have to become a positive freak. It simply means you need to define your principles and ensure that you know your worth. If your boss bullies you, stand up to him/her. If your colleagues damage your reputation, talk to them cordially instead of being passive aggressive or stressful. You and you alone have the power to stand up for yourself. When you let go of the fears that control your movements, you will find yourself more relieved. One of the biggest reason we endure a tough workplace is because we get caught up in the rat race. Do you honestly think it’s worth it to sacrifice your time, your health, and your family life for a new promotion, a new raise or a new title? Is it worth it to do those extra hours and overtime just so you may be eligible to receive a bonus from which you would buy the new iPhone? The second step to beating stress is learning to want less, simplify life, and not get caught up in this quest for achieving materialistic and capitalistic successes. When you learn to align life’s priorities, you can find a new sense of freedom; one that has never been there before. This leads us to the third point - cherish and nourish your life. Change doesn’t take place overnight. It takes place gradually. Start small. Begin an exercise routine. Go home on time. Make your own dinner, spend time with your loved ones, be kind to yourself. The fast food we eat, the sedentary lifestyle we live, and the overly stimulating devices we are surrounded with accelerate our stress levels and make us constantly lethargic or deprived of real experiences. Try to take a walk every evening, spend more time reading rather than using your phone. How does this relate to stress at work? Well, if you have a good time at home, or balance in your life, you’ll do better at work. Instead of chaotic mornings, you’ll have focused mornings because you were able to sleep well at night. Think of all the things you could possibly do only if you learned how to make some meaningful changes in life. That doesn’t mean you literally become lazy and look for shortcuts. To deal with stress at work, you first need to learn to manage your work hours and your proficiency. Learn to work smarter instead of harder. Learn to organize your work process. If you’re already a smart worker, then you surely must be having some free hours left. During that time, try to learn a new skill and shift your focus away from gossips or unhealthy conversations. People who work smart do not need to stay late hours nor do they have to take on unnecessary stress. Manage your time and your hours. Unless absolutely critical, avoid working after-hours or over the weekends. The time you have after work is just for you. As long as you don’t step into other people’s territories and bother with useless office politics, you’ll be quite relieved. Just do your work and leave the rest up to your performance results. Be nice to all, be kind to all, but don’t equate kindness to being a doormat. Keep to yourself and do not get tempted into talking behind anyone’s back, no matter how much you dislike them. In the long run, everyone fends for himself, especially when office politics take an ugly turn. You may be stuck in a situation that could destroy your reputation and make your job a living nightmare. Sometimes you do your best, but you still end up suffering from severe stress. Often there are two reasons behind it - a bad boss or a bad company culture. A bad boss will never appreciate you not because you don’t do well, but because they aren’t able to be better leaders. A negative company culture will treat its employees like slaves and enforce people to work late hours, meet unreasonable deadlines, and constantly look to cost-cutting rather than benefit sharing. Such companies seldom have room for growth and are even detrimental to the quality of your life. Yet many people choose to stay in such companies because they think they are not worth other organizations or because they don’t have the right skill set. Know that a bad work environment should act as a motivator for you to improve your skill set and look for work that does not hamper your mental health. Despite all your efforts, sometimes stress may be too deeply ingrained. When that happens, you could be clinically depressed, and your ability to function well in life may be greatly limited. This is when you need to seek out the help of a specialist rather than trying to ignore it. Remember, the more you ignore your mental health, the more you may be at risk of aggravating it. Sometimes, we are not able to deal with life’s mounting pressures, and thus it is always best to ask for help. Work doesn’t have to be a gruelling experience, but if it affects your mental and physical health, it’s time to find ways to manage work rather than end up clinically depressed, burned out or completely broken down.